Aside from the beautiful land, what I love most about Canada is our diversity and that we’re generally a country that celebrates multiculturalism. Being a child of immigrants, my parents left their families and travelled here for university. Of course, it wasn’t easy – getting comfortable with the language and having to work harder to prove their worth – yet, they love their decision and would never return to Hong Kong … Canada is home. 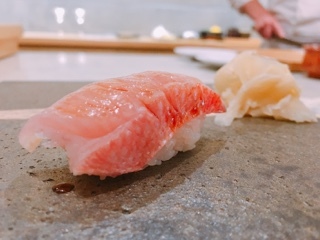 Hence, when it came time to celebrate Canada’s 150 anniversary, forgoing the typical BBQ and celebrating with Shoushin’s special Canada omakase ($150), served until the end of July 2017, seemed like the patriotic thing to do. 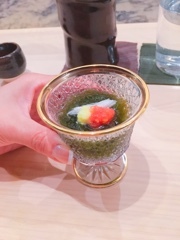 The first bite from the dinner is the mozuku, a refreshing start with finely cut seaweed slivers mixed with a sweet vinegar. Its consistency is a bit slippery, but since the seaweed has little flavour, it’s not off putting. Garnished with tomato pulp, grated ginger, and daikon slivers, these add a nice crunch and additional flavours to the starter to keep it interesting. As a first experience goes, the lobster sashimi wasn’t horrible. 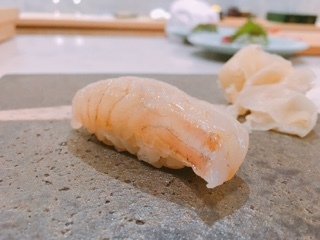 Although it’s not something I’d want to eat again, the east coast crustacean actually had a crunchy consistency and wasn’t soft and gummy as expected. 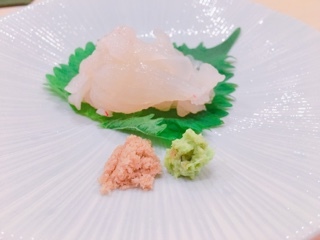 Chef Lin notes that lobster sashimi is really about the texture as it has little taste. 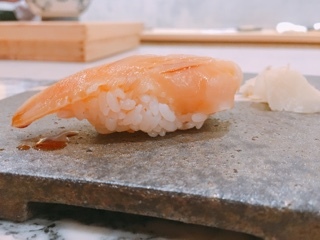 He was right; while it was simply adorned with seaweed salt and wasabi, I still couldn’t taste much sweetness (something that seems to develop when it’s cooked). 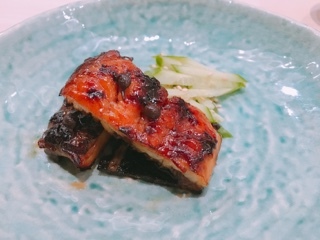 The aroma emitted from the grilled unagi is heavenly, the perfume of sweet caramelized soy that makes you want to dig in right away. Since the eel is from Quebec, it’s much larger and hence meatier than the typical unagi found on rice or topping sushi. Glazed with mirin, soy sauce, and chocolate (if I heard correctly), it’s sweet and peppery thanks to the chilli berries on top. It would have been even better if it were cooked a touch less as I found one piece a tad chewy and dry. 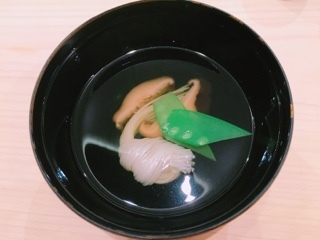 Before the sushi procession begun, a bowl of nyumen arrives, the kelp and bonito infused broth swimming with silky somen noodles, crunchy snow peas, and earthy re-hydrated shiitake mushrooms. The dish is simple but wonderful, the soup ideal for readying the palette for the raw seafood that follows. 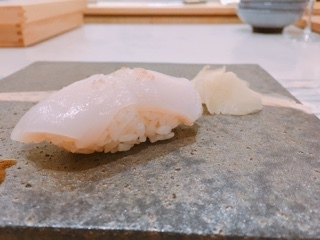 Starting light, the first piece of sushi was a Japanese flounder. While it’s a meaty fish, there’s an interesting almost fluffiness to its consistency. Though the west coast big reef squid’s slightly sticky chewy texture isn’t the greatest, it’s not repulsive either and likely due to the thicker slice given. After getting past the consistency, it’s a nice light squid with the main flavours stemming from the swipe of soy on top. The golden eye snapper is always a treat, even as a milder fish, there’s still a prevalent flavour to it and pairs rather nicely with the vinegar mixed into the rice. As commended in a previous post, Shoushin makes excellent rice: it’s heavier on the vinegar so that grains actually have flavour and the temperature is spot on (warm enough to enhance the fish without changing the temperature). 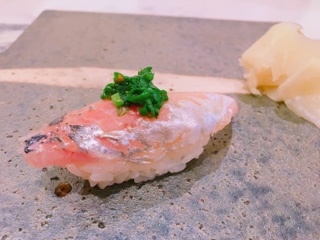 Shoushin also makes amazing horse mackerel sushi! Since the fish is cleaned so well any gamey fishiness is removed. On this occasion, they added a healthy sprinkle of green onion on top creating an extra zip to the sushi. It’s by far the best horse mackerel I’ve had. Midway through the 11-piece sushi meal the tuna parade starts, following the leanest to fattiest sequence. 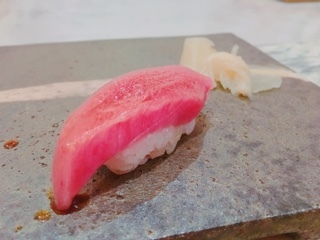 The lean blue fin tuna has that vibrant red colour that’s so mesmerising. Meanwhile, the warmer rice with the medium chu toro was fantastic, causing the tuna taste to cover the tongue and linger even after the piece was finished. 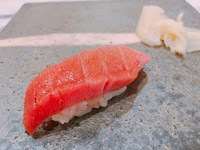 Typically, the fattiest piece of the tuna comes from the otoro or tuna belly. 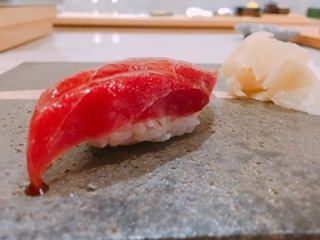 In this case, Shoushin introduced me to the fattiest part of the tuna’s back, which still melts in the mouth and has a much stronger flavour. After such lovely pieces of tuna, the gizzard shad was out of place. 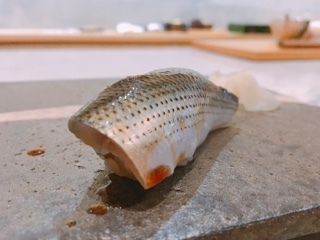 Having had it before, this piece was overly salty and the skin too thick – it felt like I was chewing forever when I just wanted to swallow the salty fish down. The east coast surf clam wasn’t any better. 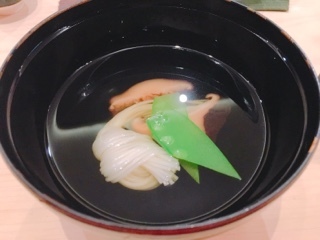 At first it had a crunchy texture emitting a sweetness, but as chewing continued, the clam finished off with a fishy aftertaste. Take my advice: chew and swallow quickly, this isn’t one for savouring. 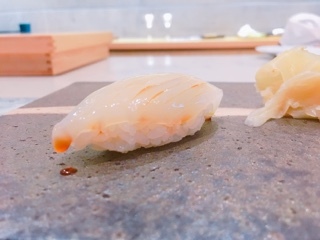 Thankfully, the following east coast scallop was better: with a hint of seaweed salt and lemon on top, the ingredients helped augment the scallop’s sweetness. Not having been blow torched, you could still taste the seafood in a delicate manner. 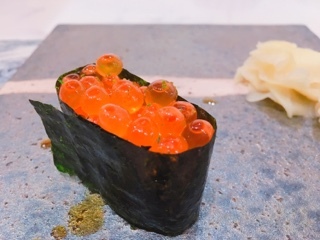 In lieu of the traditional hand roll, a piece of sushi topped with pop-in-your-mouth Canadian fish eggs arrived. With a light dusting of yuzu zest on top, it was a cold and refreshing ending. Of course, we were also served a piece of tamago, which Shoushin does so well. 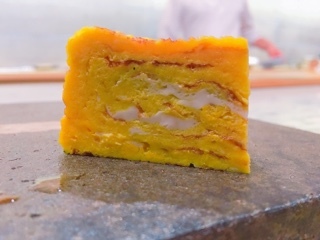 The beautiful layers and rich delicately sweetened egg is the perfect bridge between sushi and dessert. Whenever they serve some sort of rendition of a green tea pudding, that’s what I have for dessert. 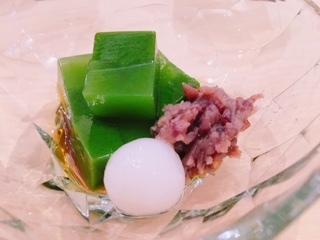 The matcha flavoured jelly is generally accompanied with a sweet red bean paste (a staple in Asian sweets) and a chewy unfilled glutinous rice ball. In this case, the Canadian theme continued with the pool of maple syrup on the bottom, helping to add a sweetness to the dessert. While not as impressive as their general Yuri tasting menu, this one was still decent. However, for something classified as a special “Canada celebration” menu, it’s disappointing that less than half of the dishes were made from Canadian ingredients. Understandably, sourcing an entire Canadian menu for sushi may be difficult, but at least the individual courses such as the seaweed (from Okinawa) and somen noodles (presumably from Japan) should be Canadian related. Either they could be sourced from Canadian ingredients (wouldn’t we produce seaweed?) or replaced with something signifying our country (an Angus beef tataki would have been delicious). Without a doubt, I love Canada for its diversity. Nonetheless, perhaps refined sashimi and sushi should be left for other days of the year.